Connect the Raven display directly to the computer with an HMDI-MiniDisplay Port, HDMI-DVI, HDMI-HDMI, or DVI-DVI connector (Users will need to purchase these cable separately). If there aren't enough ports on the computer to connect the Raven displays, then a Thunderbolt HUB maybe needed to add another HDMI port and Thunderbolt port. Last, connect the Raven Touch Panel USB directly to the computer with the included USB cable. Note: Using a USB HUB may cause touch drop outs, also using long HDMI/DVI cables or Extenders may cause graphic or resolution issues. In order to use the Raven software, users will need to first Register the included Passcode, Activate the Ilok License once the Registration email has been sent, and Download the Software from the Slate User Account. Click Here to go to the Raven Registration page to start the registration procedure. 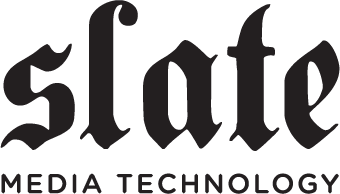 If you have an account and are updating the software, click Here to login to your Slate Account. Watch this video to follow along for more instructions. Note: When purchasing a used Raven, the previous owner will have to contact Slate MT in order to transfer the Registration to the new users account.Also, the original owner will have to transfer the iLok to the new user's iLok account and pay the $25 transfer fee. or the "System Tray" in the task bar of PC Windows. Check the Status of the Raven is set to monitor 1. If not, click the "Configure" menu item and run through the prompts. If the Raven is the only display connected to the computer then follow steps to configure here for Mac OSX. or here for PC Windows. If the Raven is being used as a secondary display with a Laptop or iMac, follow steps to configure here for Mac OS X or here for PC Windows. If the Raven is being used as in "Dual Mode" with two touch screens, follow steps to configure here for Mac OS X or here for PC Windows. Note: The Raven displays must be set to the most "Left" and "Top" display if using multiple monitors. Adding any extra display above or to the left of the Raven may cause alignment issues within the Raven application and the DAW application. Open the Multi-Touch Platform application and check the serial number is shown. Select the "Calibrate" button and run through the prompts. If the Raven is the only display connected to the computer then follow steps to configure here for Mac OSX or here for PC Windows. If the Raven is being used as a secondary display with a Laptop or iMac no configuration will be necessary, however on Windows users click here for PC Windows. In order for the Raven application to work correctly, certain Operating System (OS) settings must be adjusted. For instance, the DAW, V-Control Pro, and the Raven application will need "Admin" privileges to allow for correct communication. One OS X, all applications need to be added to the "System Preferences/Privacy/Accessibility menu, click Here for further instructions. For Windows PC users, right click on the applications and in the "Advanced" menu, set these applications to "Run as Admin. click Here for further instructions. The Raven application uses V-Control Pro to communicate with the DAW, so before running the Raven, V-Control Pro must be synced with the DAW. Open the open the V-Control Pro "Setups" menu by clicking the "V" logo from the OS X "Menu Bar" or the Windows "System Tray" . Open the DAW and once it appears in the V-Control Pro "Software" tab of the "Setups" window follow the instructions provided. Note: The Raven setup button is only for the 1st time using the software, or resetting up the Raven once the DAW preferences have been trash. Running the setup twice, may add duplicates of V-Control Pro and other settings. Once V-Control Pro and DAW are configured and Raven Application is open, the "Stop" button on the Raven Transport will be in the "down" and lit up in blue. To check communication, press the Raven "Play" button on the transport. If the button engages, and triggers the DAW, then communication is working correctly. If the "play" button responds to touch but doesn't trigger the DAW, then there is a HUI, V-Control Pro, or MIDI Controller error. If the "Play" button does respond to touch and doesn't blink or react when pushed on from the Raven touch screen, then there is an issue with the touch driver. MTi2 users check UPDD. TUIO is enabled, and MTi1/MTX users, be sure Multi-Touch Platform is on and sending TUIO. The Raven application relies on three items to be setup correctly to function. If the Touch Driver, Operation System, and V-Control Pro have not been setup correctly the Raven application will not be able to control the DAW and the OS as required. The most important part of the Raven application is the Raven Internal Mixer, this mixer requires perfect pixel alignment with the DAW to synchronize completely. The easiest way to align the Raven Internal Mixer and the DAW is to import the "Raven Window Layouts Templates" into your DAW. Pro tools uses "Windows Configurations", Logic Pro uses "Screensets", Cubase uses "Workspaces" and Digital Performer uses "Windows Sets"
The Raven uses key commands, menu items, and custom scripts to access and control the DAW. Any BC that uses uses multiple key commands to perform a complex task will need to be launch in the correct manner to perform correctly. i.e When adding plugin chains on Pro Tools, the Mixer window must be up "Front" and the "Track List" must be open. Be sure to watch the Batch Commander Basic Training Videos to learn how to setup correct. The Batch Commander Manuals for Pro Tools, Logic, Ableton, Cubase, Studio One, and Digital Performer. will also walk through the correct setup. Lastly, please visit the Slate Forum for question and custom Batch Commands.